The gene is the physical unit of heredity. For each physical trait—such as eye color, height, hair color—a person inherits two genes or two groups of genes, one from each parent. One gene, called the dominant gene, usually overpowers the weaker, called the recessive gene. Sometimes genes on the same chromosome are not inherited together. When reproductive cells divide to form an egg or sperm cell (a process called meiosis), each chromosome pairs off with a partner. As the chromosomes lie side by side, groups of genes from one chromosome may trade places with groups of genes from the partner chromosome. This is called crossing over and explains how families inherit different combinations of linked traits. Heredity first began to be understood due to the work of Austrian monk and botanist Gregor Mendel (1822-1884), who discovered that hereditary factors determine all hereditary traits. Although Mendel was not recognized for his work at the time, modern genetic science is solidly based on Mendel's findings. Experimenting with pea plants, Mendel noticed that the plants inherited traits in a predictable way. It was as though the pea plants had a pair of factors responsible for each trait. Even though he never actually saw them, Mendel was convinced that tiny independent units determined how an individual would develop. Until then, traits were thought to be passed on through a mixing of the mother and father's characteristics, much like a blending of two liquids. Mendel's laws of heredity were rediscovered in 1900, when they became vitally important to biologists. Among other things, Mendel's laws established heredity as a combining of independent units, not a blending of two liquids. Danish geneticist Wilhelm Johannsen (1857-1927), a strong supporter of Mendel's theories, coined the term "gene" to replace the variety of terms used to describe hereditary factors. His definition of the gene led him to distinguish between genotype (an organism's genetic makeup) and phenotype (an organism's appearance). A gene. Genes are passed from parent to offspring at the time the child is conceived and are located in the chromosomes in the cells of the human body. that they cross over. For his research, Morgan received the Nobel Prize for medicine in 1933. Researchers knew that chromosomes contained deoxyribonucleic (pronounced "dee-oxy-rye-boe-noo-clay-ic") acid, or DNA, which is a subfamily of the nucleic acids. As more experiments showed the connection between DNA and genetics, researchers wondered how a DNA molecule could code for genetic information. Two scientists, American James Dewey Watson (1928-) and Englishman Francis Harry Compton Crick (1916-), believed that the structure of DNA held the key to understanding how genetic information is stored in a cell and how it is transmitted from one cell to its offspring. 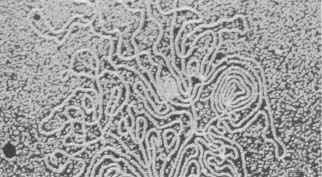 The two researchers used X-ray crystallography to "photograph" DNA. On March 7, 1953, Watson and Dewey built a model consisting of two helices (corkscrew-like spirals), wrapped around each other. Watson and Crick immediately saw how the molecule could "carry" genetic information. The sequence (series) of four nitrogen bases—adenine, guanine, thymine, and cytosine, or A, G, T, C—acts as a genetic code, instructing the cell to make specific proteins. The scientists helped decipher the genetic code, a process that involved dozens of researchers over the next decade.